I enjoy leading and learning, and am privileged to have nurtured a team, who are comfortable to give me constructive feedback that I continuously learn from. Allowing my team members to express themselves and to actively participate in making decisions about fabric, designs and the final look and feel of collections, has proved to me that the Boss doesn’t always have to make all the decisions. Some of our most successful designs have come from input from the seamstresses who vary in age from 30 – 60 years old. For so long I did this alone, now working as a team, is so much more rewarding than working solo. I’m sharing this little rant of mine because it’s one of those stories that starts out as a negative, and turns into a huge positive. I try my hardest to provide the best service I can, and yes I’m human, but I have as many checks in place as I can, to make sure that we don’t slip up, and if we do, they are minor slip-ups that won’t destroy a relationship with either a client or a supplier. So when I’m on the receiving end of really bad service, that is potentially damaging to my business and my reputation, I do tend to get a little angry, and worried about who I am entrusting my brand to. ‘Why am I teaching my courier company who are going to handle all my online deliveries, and my bank who are going to handle the payments, about customer service and communication? Uncollected parcels…no communication for reasons. Undelivered business credit card ordered end Feb, been sitting with relationship manager since first week of March. Am I missing something here? I thought collecting parcels and delivering credit cards was the easiest part of both jobs! So whilst sitting pondering a whole lot of things about these two situations, this pertinent quote popped into my head. And that is the positivity that came out of the rant. The bigger I dream for Hayley Joy, the bigger and better I am going to deliver. I want to prove, that it doesn’t matter how big we grow, my commitment to providing good service when I opened Hayley Joy retail 9 years ago, was and is, always going to be my number one priority. I have hand picked the right people in the right positions, and together we are going to make your online shopping experience, is as good as your physical experience is, when you shop at Hayley Joy retail. 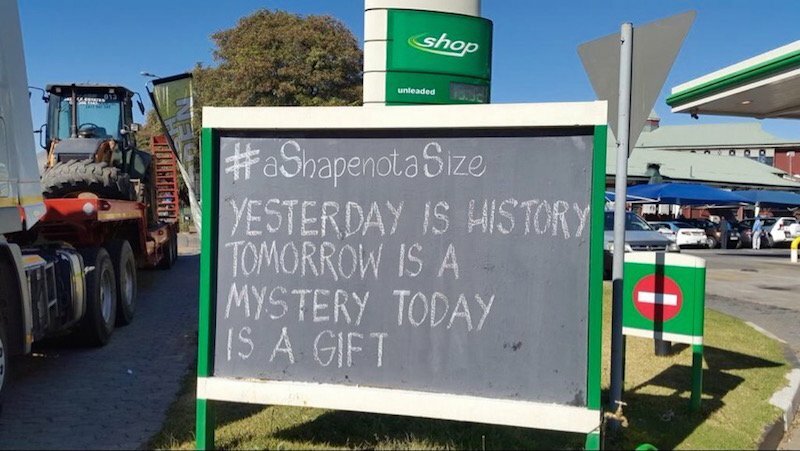 Now A Shape not a Size is a reality. Is it really possible that on day one of Hayley Joy’s Shape Revolution, we were featured by @PumpOracle on Jan Smuts Ave. This is all taking great SHAPE! !